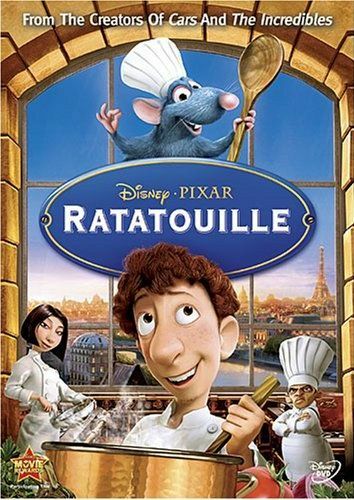 Disney and Pixar's latest computer animated feature film, Ratatouille, is out of theaters and onto DVD and Blu-ray. My wife and I didn't catch this in the theater as the trailers just didn't make it look worth the money, so for DVD we waited. And yes, I said DVD, not Blu-ray, as even though we both absolutely LOVE movies, we just can't justify spending our life savings upgrading our entire A/V setup just to see a sharper picture, especially since the companies can't even agree on a high-definition standard. And I'm sure a lot of you there feel the same way, due to the slow adoption of the technology. But I digress, Ratatouille is what I'm here to tell you about, not my qualms with high-definition disc technology. 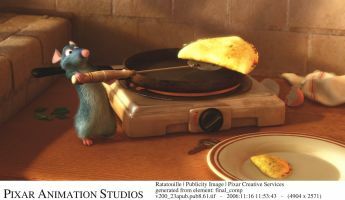 Ratatouille is a tale about a rat named Remy who has a wonderful palette, and I'm talking about scent and taste-buds here, I don't mean he is all multicolored or anything... although he is blue, while the rest of his family brown. Anyway, unlike the rest of Remy's family, Remy HATES eating garbage (I feel for ya, pal). So one day when Remy is in an old lady's kitchen trying to put together a delicious meal, he and his brother inadvertently awaken her, causing all sorts of chaos to ensue while she chases them around the house attempting to kill them with a shotgun! Eventually, Remy and his entire family (who apparently lived in the attic) must flee the house, and Remy gets separated from his family in the sewers. All alone in a strange and lonely place, Remy's imaginary friend (Remy's idol, a chef named Gusteau who recently passed away) helps convince the rat to go above ground. 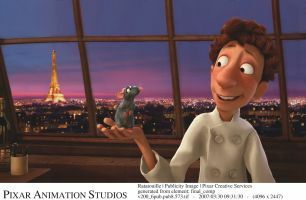 And when he does, he discovers that he's in Paris, and coincidentally right near the late Gusteau's famous restaurant. So of course he has to go check it out, and of course he accidentally ends up in the kitchen, which finds himself fighting for his life to make it to the open window for escape. But when he finally makes it, his love for food makes him turn around and help out a young trash boy named Linguini who accidentally spilled part of a pot of soup and tried to fix it by throwing in some random spices. Well, turns out everybody loves the soup that Remy fixed up, but since they think that Linguini did it they make him a chef! But Linguini knows the truth; he saw Remy fixing up the soup, and so the two make a deal. Remy will cook while Linguini gives the appearance of cooking. But it's how they implement this that kind of lost me. As it turns out, pulling on Linguini's hair will cause his limbs to move. So Remy gets on Linguini's head and pulls his hair to control Linguini's body. This takes a big leap of faith, and unfortunately it was one I couldn't make all the way, especially since pulling his hair actually OVERRIDES Linguini's control of his own body. The story was enjoyable, and there were some laughs, though I think it was nowhere as good as other Pixar ventures, such as Toy Story, the Incredibles, Finding Nemo, Cars, and A Bug's Life. The animation was excellent, especially the fur and the liquids, and there was some really nice shots of Paris at nice, but overall it really didn't strike my funny bone that hard, nor did I really feel involved with the characters. What I really, really loved on this DVD, however, was the animated short "Lifted". It didn't have any dialog, but it had us both laughing out loud uncontrollably. You'll probably end up watching that thing a few times. If nothing else, you'll probably want to rent this DVD just to see that. There's also another animated short called Your Friend the Rat which tells about Rats through history, and it's pretty good as well. Not laugh-out-loud funny like lifted, but enjoyable nonetheless and actually a bit educational. Ratatouille was release by Disney on November 6, 2007. See the official website for more.